Another Bloomer. - Welcome to The City of Desire. Griffith Buck Rose "Winter Sunset. ", a photo by Leenechan on Flickr. I ended up cutting flowers off "Prairie Star" and "Folksinger" and putting them in a cordial glass. The flowering canes were half-broken, and the flowers were starting to get beat up. Thankfully both roses have another bud on an undamaged cane set to bloom in a few days. 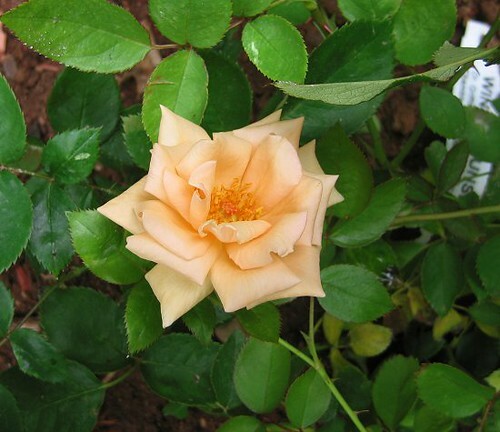 "Folksinger" is an especially beautiful rose. No sign of thrips on "Prairie Star." I always worry about the white roses. It's good to know that thrips aren't endemic in my yard! I counted seven flowerbuds on "Julia Child." It's not called a floribunda for nothing!